Landfill leachates are potential threats for environmental degradation. 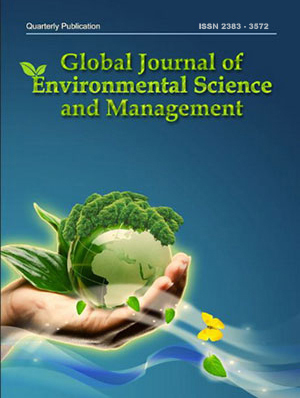 This study was conducted to determine the leachate quality, to identify the dominant pollutants and to evaluate the leachate pollution potential of an active and closed dumping ground of an uncontrolled municipal solid waste landfill site in Kolkata, India using leachate pollution index. The results of the physico-chemical and biological analyses of leachate indicated that landfill site was in its methanogenic phase. Among the analysed leachate pollutants, TDS, BOD5, COD, TKN, NH3-N, Cl¯, TCB, Pb, and Hg surpassed the leachate discharge standards for inland surface water as specified by the municipal solid waste (Management and Handling) Rules, 2013 for both the dumping grounds. Moreover the concentrations of total Cr and Zn also exceeded the leachate disposal standards for the active dumping ground. The leachate pollution potentialities of both the active and closed dumping grounds were comparable as the overall LPI obtained 34.02 and 31.80 respectively. The overall LPI, LPI organic (LPIor), LPI inorganic (LPIin) and LPI heavy metals (LPIhm) of both the dumping grounds largely exceeded the LPI and sub-LPI values for treated leachate before disposal to the inland surface water. In terms of the individual pollution rating, total coliform bacteria, TKN, NH3-N and Hg were identified as the dominant pollutants and major contributing factors for the leachate pollution potential. Abd EI-Salam, M.M. ; Abu-Zuid, G.I., (2015). Impact of landfill leachate on the groundwater quality: A case study in Egypt. J. Adv. Res., 6(4): 579–586 (8 pages). APHA, AWWA, WPCF, (1999). Standard methods for the examination of water and wastewater, 20th Ed., Washington DC, USA. Aravind, J.; Sudha, G.; Kanmani, P.; Devisri, A.J. ; Dhivyalakshmi, S.; Raghavprasad, M., (2015). Equilibrium and kinetic study on chromium (VI) removal from simulated waste water using gooseberry seeds as a novel biosorbent. Global J. Environ. Sci. Manage., 1(3): 233–244 (12 pages). Awaz, B.M., (2015). Leachate and groundwater assessment at Kirkuk sanitary landfill site in ZindanaVillage, Iraq Int. J. Environ. Res., 9(2): 457-466 (10 pages). Chattopadhyay, S.; Dutta, A.; Ray, S., (2007). Existing municipal solid waste management of Kolkata, Deficiencies and its solutions. J. Indian Assoc. Environ. Manage., 34 (3): 161–167 (7 pages). Chattopadhyay, S.; Dutta, A.; Ray, S., (2009). Municipal solid waste management in Kolkata, India: A review. Waste Manage., 29: 1449–1458 (10 pages). Chian, E.S.K. ; De Wallee, F.B., (1976). Sanitary landfill leachates and their treatment. J. Env. Eng. Div., 102: 411–431 (21 pages). Christensen, T.H. ; Kjeldsen, P.; Albrechtsen, H.J. ; Heron, G.; Nielson, P.H. ; Bjerg, P.L. ; Holm, P.E., (1994). Attenuation of landfill leachate pollutants in aquifers. Crit. Rev. Environ. Sci. Technol., 24; 119‒202 (84 pages). Chu, L.M. ; Cheung, K.C. ; Wong, M.H., (1994). Variations in the chemical properties of landfill leachate. Environ. Manage., 18(1); 105–117 (13 pages). Clement, B.; Merlin, G., (1995). The contribution of ammonia and alkalinity to landfill leachate toxicity to duckweed, Sci. Total Environ., 170:71‒79 (9 pages). Demirbilek, D.; Onal, A.O. ; Demir, V.; Uslu, G.; Arslanoglu-Isık. H., (2013). Characterization and pollution potential assessment of Tunceli, Turkey municipal solid waste open dumping site leachates. Environ. Monit. Assess., 185: 9435–9449 (15 pages). Eggen, T.; Moeder, M.; Arukwe, A., (2010). Municipal landfill leachates: a significant source for new and emerging pollutants. Sci. Total Environ., 408(21): 5147–5157 (11 pages). Erses, A.S.; Onay, T.T. ; Yenigün, O., (2008). Comparison of aerobic and anaerobic degradation of municipal solid waste in bioreactor landfills. Bioresource Technol., 99: 5418–5426 (9 pages). Fang, J.J.; Yang, N.; Cen, D. Y.; Shao, L. M.; He, P. J., (2012). Odor compounds from different sources of landfill: characterization and source identification. Waste Manage., 32(7): 1401–1410 (10 pages). Fatta, D.; Papadopoulos, A.; Loizidou, M., (1999) A study on the landfill leachate and its impact on the groundwater quality of the greater area, Environ. Geochem. Health. 21 (2): 175-190 (16 pages). Foo, K.Y. ; Hameed, B.H., (2009). An overview of landfill leachate treatment via activated carbon adsorption process. J. Hazard. Mater., 171: 54–60 (7 pages). Gupta, V.K. ; Sadegh, H.; Yari, M.; Shahryari Ghoshekandi, R.; Maazinejad, B.; Chahardori, M., (2015). Removal of ammonium ions from wastewater. A short review in development of efficient methods. Global J. Environ. Sci. Manage., 1(2): 149–158 (10 pages). Hazra, T.; Goel, S., (2009). Solid waste management in Kolkata, India: Practices and challenges. Waste Manage., 29: 470–478 (9 pages). Johansen, O. J.; Carlson, D. A., (1976). Characterization of sanitary landfill leachates. Water Res., 10: 1129–1134 (6 pages). Kale, S.S.; Kadam, A.K. ; Kumar, S., (2010). Evaluating pollution potential of leachate from landfill site, from the Pune metropolitan city and its impact on shallow basaltic aquifers. Environ. Monit. Assess., 162: 327–346 (20 pages). Karbassi, A.R. ; Tajziehchi, S.; Afshar, S., (2015). An investigation on heavy metals in soils around oil field area. Global J. Environ. Sci. Manage., 1(4): 275–282 (8 pages). KEIP, (2005). Rapid environmental impact assessment report and environmental management plan of engineered landfill at Dhapa. Kolkata environmental improvement project. Kolkata Municipal Corporation, India. Kim, K.R. ; Owens, G., (2010). Potential for enhanced phytoremediation of landfills using biosolids–a review. J. Environ. Manage., 91(4): 791–797 (7 pages). Kjeldsen, P.; Barlaz, M. A.; Rooker, A. P.; Baun, A.; Ledin, A.; Christensen, T.H., (2002). Present and long term composition of MSW landfill leachate: A Review. Crit. Rev. Environ. Sci. Tech., 32 (4): 297‒336 (40 pages). Kumar, D.; Alappat, B.J., (2003a). A technique to quantify landfill leachate pollution. Proceedings of the ninth international landfill symposium, Cagliari, Italy, October, Paper No. 400. Kumar, D.; Alappat, B.J., (2003b). Analysis of leachate contamination potential of a municipal landfill using leachate pollution index. Proceedings of the workshop on sustainable landfill management, Chennai, India, 3–5 December, pp. 147–153 (7 pages). Kumar, D.; Alappat, B.J., (2005a). Evaluating leachate contamination potential of landfill sites using leachate pollution index. Clean Tech. Environ. Pollot., 7: 190‒197 (8 pages). Kumar, D.; Alappat, B.J., (2005b). Analysis of leachate polltion index and formulation of sub-leachate pollution indices. Waste Manage. Res., 23: 230‒239 (10 pages). Laner, D.; Crest, M.; Scharff, H.; Morris, J. W.; Barlaz, M. A., (2012). A review of approaches for the long-term management of municipal solid waste landfills. Waste Manage., 32(3): 498–512 (15 pages). Li, W.; Hua, T.; Zhou, Q.; Zhang, S.; Li, F., (2010). Treatment of stabilized landfill leachate by the combined process of coagulation/flocculation and powder activated carbon adsorption. Desalination, 264: 56-62 (7 pages). Lo, I.M.C., (1996). Characteristics and treatment of leachates from domestic landfills. Environ. Int., 22(4): 433–442 (10 pages). Mandal, M., (2007). Leachate from municipal solid waste generation, characteristics and effects. MSc. Thesis, Bengal Engineering and Science University, Shibpur, Howrah, India. Matejczyk, M.; Płaza, G.A. ; Nałęcz-Jawecki, G.; Ulfig, K.; Markowska-Szczupak, A., (2011). Estimation of the environmental risk posed by landfills using chemical, microbiological and ecotoxicological testing of leachates. Chemosphere, 82(7): 1017–1023 (7 pages). MoEF, (2013). Municipal solid waste management and handling rules. New Delhi: Ministry of Environment and Forests, Government of India. Mor, S.; Ravindra, K.; Dahiya. R.; Chandra. A., (2006). Leachate characterization and assessment of groundwater pollution near municipal solid waste landfill site. Environ. Monit. Assess., 118: 435–456 (22 pages). Nguyen, T.A.H. ; Ngo, H.H. ; Guo, W.S. ; Zhang, J.; Liang, S.; Yue, Q.Y. ; Li, Q.; Nguyen, T.V., (2013). Applicability of agricultural waste and by-products for adsorptive removal of heavy metals from wastewater. Bioresource Tech., 148: 574–585 (12 pages). Paoli, L.; Corsini, A.; Bigagli, V.; Vannini, J.; Bruscoli, C.; Loppi, S., (2012). Long-term biological monitoring of environmental quality around a solid waste landfill assessed with lichens. Environ. Pollut., 161: 70–75 (6 pages). Parth, V.; Murthy, N.N. ; Saxena, P.R., (2011). Assessment of heavy metal contamination in soil around hazardous waste disposal sites in Hyderabad city, India: Natural and anthropogenic implications. E3 J. Environ. Res. Manage., 2(2): 27–34 (8 pages). Patra, U.; Gupta, S.; Talapatra, S.N. ; Giri, A.K., (2001). Genotoxic effects after in vivo exposure of vegetable extracts containing heavy metals from the Dhapa area of Calcutta, India. I. Effects of cauliflower, spinach and radish. Food Chem. Toxicol., 39(1): 67‒72 (6 pages). Schiopu, A.M.; Gavrilescu, M., (2010). Options for the treatment and management of municipal landfill leachate: common and specific issues. CLEAN, 38(12): 1101–1110 (10 pages). Seo, D.J. ; Kim, Y. J.; Ham, S. Y.; Lee, D. H., (2007). Characterization of dissolved organic matter in leachate discharged from final disposal sites which contained municipal solid waste incineration residues. J. Hazard. Mater., 148(3): 679–692 (14 pages). USEPA, (2010). Landfill methane outreach program (LMOP). Methane to markets. United State Environmental Protection Agency. https://www.globalmethane.org/data/1128_dhapa. assessment.report.4-27-10.pdf. Umar, M.; Aziz, H.A. ; Yusoff, M.S., (2010). 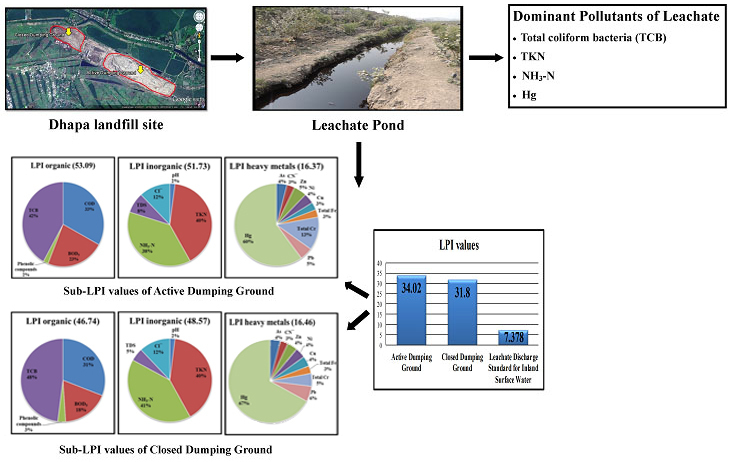 Variability of parameters involved in Leachate Pollution Index and determination of LPI from four landfills in Malaysia. Int. J. Chem. Eng., Article ID 747953. doi:10.1155/2010/747953 (6 pages). Yusof, N.; Haraguchi, A.; Hassan, M.A. ; Othman, M.R. ; Wakisaka, M.; Shirai, Y., (2009). Measuring organic carbon, nutrients and heavy metals in rivers receiving leachate from controlled and uncontrolled municipal solid waste (MSW) landfills. Waste Manage., 29: 2666–2680 (15 pages).